Baisakhi or Vaisakhi, the harvest festival, is celebrated with great enthusiasm to mark the beginning of the new spring and is celebrated in most of India as the new year by Hindus. It signifies the end of the harvest season in India, marking a time of prosperity for the farmers. Also called as Vaisakhi, it is a festival of tremendous joy and celebration. Baisakhi is especially significant to Punjab and Haryana, because of the large Sikh population who celebrate this festival with a lot of energy and vigour. This festival is celebrated as Pohela Boishakh in West Bengal, Puthandu in Tamil Nadu, Bohag Bihu in Assam, Pooram Vishu'in Kerala, Bihu in Uttarakhand, Maha Vishuva Sankranti in Odisha, and Ugadi in Andhra Pradesh and Karnataka. The festival of Baisakhi falls on the first day of Vaisakh month (April-May) according to the Sikh Calendar. For this reason, Baisakhi is also referred to as Vaisakhi. Baisakhi also marks the Punjabi New Year. According to English calendar, the date of Baisakhi corresponds to April 13 every year and April 14 once in every 36 years. This variation is due to the festival being observed as per the Indian solar calendar. This year Baisakhi falls on 14 April. The Sikhs celebrate Baisakhi by bathing in the holy river and visiting the Gurudwaras, where they take part in the prayers held during the day. 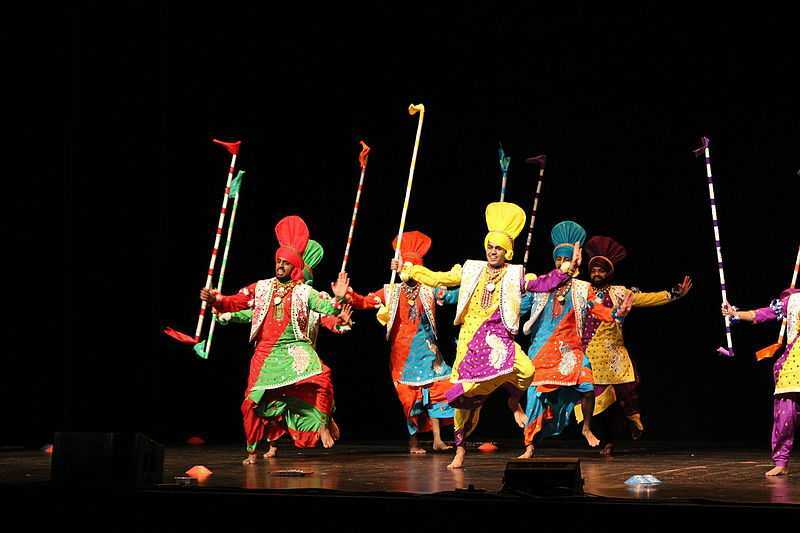 Baisakhi gets everyone into the festive mood, and people like to dance their heart out. Special celebrations occur at the Talwandi Sabo, where Guru Gobind Singh recompiled the sacred Granth Sahib, the Gurudwara at Anandpur Sahib, where Khalsa was born, and the Golden Temple in Amritsar. Farmers thank God for the bountiful harvest and pray for prosperity in the coming year. The phrase 'Jatta Aayi Baisakhi' is loudly declared across the fields by gleeful farmers as they passionately dance in celebration, an exciting way of greeting the festival. After the prayers or Ardas, the Karah Prasad is offered to the guru and then distributed among the people. This is followed by a special guru-ka-langur or community lunch at the Gurudwaras, following which the procession of Nagar Kirtan is carried out through the streets, where devotional songs are sung by all in honour of this sacred observance, while revellers take the celebration with the enthusiastic and vibrant display of song and dance in the most colourful garb. Dress: As a celebration of the new spring, Vaisakhi is an occasion which sees men, women and children commemorate this joyous occasion by buying new attire, picking the most lively and dynamic of the lot to reflect the atmosphere of happiness felt throughout the crowd. Traditional Punjabi attire for men includes the turban with the fan-like adornment worn with a kurta, a waistcoat, the rummal or scarf, and the lungi tied around their waist, while the women wear the customary garments of Salwar Kameez with the most festive and ostentatious jewellery. The multi-coloured brilliance of this attire reflects the perky and bubbly nature of the Punjabi way of living. Food: Multiple food stalls are set up at the Baisakhi fairs to keep the crowds refreshed and energised as they party all night. Quintessentially Punjabi cuisine like Chhole Bature, Achari mutton, Chicken saagwala, Sarson ka saag, kadhi chawal, dry fruit kheer and the famous lassi are ever present at the fair. These gastronomic delights are representative of the great love of food and flavour displayed by the people of Punjab. The traditional dances of Bhangra and Gidda are performed during Baisakhi to the beat of the drums in open fields creating an atmosphere of zest and joy. At some places, fairs are held where people bring out their happiness and perform bhangra, gidda and acrobatics. Men, women and children adorn themselves in colourful clothes and jewellery while they excitedly participate in the festivities. The Baisakhi Procession, also known as Nagar Kirtan, is an important part of the celebrations in Punjab. The most sacred scripture Granth Sahib is taken out with honour by traditionally dressed Panj Piaras, also known as the five senior religious Sikhs, and an important part of the Khals traditions. Baisakhi processions move through the streets and lanes of the city, accompanied by music, singing and chanting of scriptures and hymns. A large number of devotees participate in the Baisakhi processions. 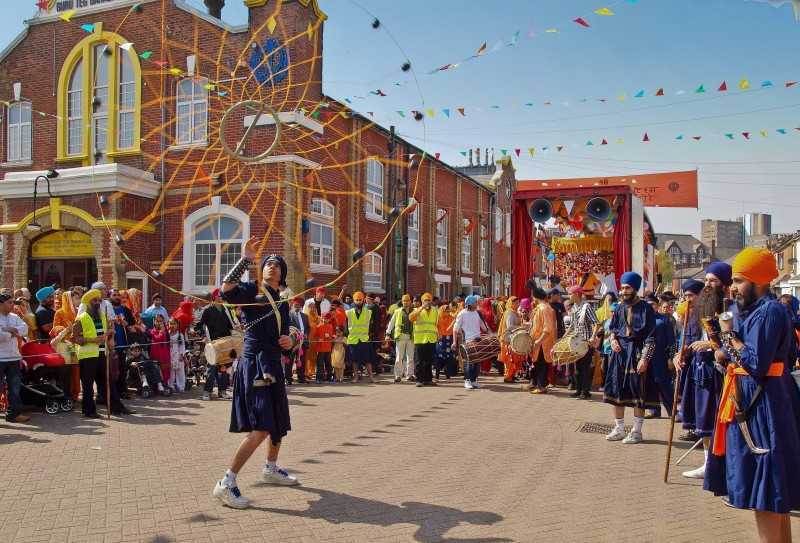 During the Baisakhi processions, children and youth demonstrate their skills in martial arts along with the drummers and bands around, and men swinging swords making the event more colourful. All in all, it's safe to say that each year, the festival of Baisakhi marks a new chapter in the life of people. Baisakhi was one of the three festivals that the third Sikh Guru, Guru Amar Das, chose to be celebrated by the Sikhs. In 1699, the ninth Sikh Guru, Guru Teg Bahadur, was publicly beheaded by the Mughals. This occurred due to his willingness to oppose the Mughal invaders and protect the cultural identity of Hindus and Sikhs whom the Mughal ruler Aurangzeb wanted to convert to Islam. On Baisakhi day of 1699, his son, Guru Gobind Rai, rallied the Sikhs and inspired them through his words and actions, bestowing upon them and himself the title of Singh or lion, thus becoming Guru Gobind Singh. The five Ks of Sikhism were adopted, and the Guru system was dispelled, with Sikhs being urged to accept the Granth Sahib as the eternal guide. Thus, the festival of Baisakhi is observed as the coronation of the last Sikh Guru, Guru Gobind Singh, as well as the foundation of the Khalsa Panth of Sikhism, granting it a position of immense importance to Sikhism, and is one of the biggest Sikh festivals. Baisakhi was also the day of the Jallianwala Bagh Massacre in 1919, when the British colonists trapped and murdered a peaceful assembly of Indians, acting as a major catalyst in the Indian freedom struggle. Food of Punjab - 17 Delicious Dishes to get you Drooling! 24 Street Foods of India: Yummy in My Tummy! 22 Festivals of Rajasthan You Simply Cannot Miss!